Whitney Johnson reintroduces the S-Curve and shares what Academy Leadership Excellence Course attendees uncover during Aligning and Accomplishing Goals workshops: Good leaders learn the goals and dreams of those in their charge. This may sound weird, especially if we were trained not to learn what we were told was “personal information,” and therefore off-limits. The result: Persistent, lousy engagement. Nationally, only 33 percent of employees are engaged in their work, according to Gallup (p. 3). Even worse, Johnson cites one survey revealing that 84 percent of employees said they felt “trapped” in their jobs (p. 4). In Johnson’s prior work, Disrupt Yourself, she asks us to focus on, or disrupt, ourselves. In her new work, she instructs us how the S-Curve may be employed to develop others, or how to apply it from a developmental point of view. adopting a developmental mindset, and utilizing the S-Curve, we may make lasting improvements, since change, not stasis, is the natural mode of human life (p. 5). 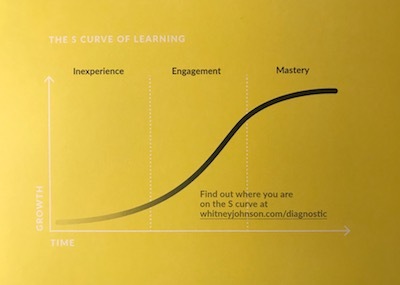 Johnson persuades us that personal disruption in the workplace – the movement of people from one learning curve to the next, one challenge to another – can drive learning, engagement, and even innovation (p. 7). Hence this review’s emphasis on adopting the S-Curve, or a developmental mentality, and application to the hiring process presented in chapters three and four, which may begin improving decades of static engagement survey scores. Johnson recommends aiming for an optimal mix of low-, middle-, and high-end-of-the-curve employees; roughly 15 percent at the low end, around 70 percent of the team in the sweet spot middle, and 15 percent at the high end of the curve (p. 18). Can you recall overcoming the initial fear and subsequent energizing period in a past job when you rapidly climbed a learning curve? That’s the sweet spot. A leader who prioritizes using a developmental-based decision-making process seeks to continuously place people where they may learn. How do we promote use of the S-Curve, or developmental framework? A simple start is to create metrics that reward talent spotters and developers (p. 24). Mark Crowley (see ChoinqueCast Episode 2) emphatically believes organizations should not promote anyone to a supervisory role unless they have been an advocate for others, or embrace a developmental leader role. Great idea. Or put more simply, when you facilitate personal disruption, you build an A-Team and become a boss people want to work for (p. 28). What to do differently? Hiring for potential rather than proficiency is the foundation for building an A-Team (p. 59). Use the S-Curve. Rather than requiring the ideal candidate to possess mastery of the entire skill set for the job, hire people for their low-end-of-the-curve capacity to fill many roles, not just the top-shelf, high-end-of-the-curve qualifications for one role (p. 65). • If only I could clone myself. • If only I could find someone to do all the annoying stuff I don’t want to do. • If only I knew how to do that. Consider this: Each of these attitudes – or self-created obstacles – seem to have roots in a scarcity mindset. It’s limiting, and usually impedes growth. Johnson also challenges us to rethink hiring: The goal of a job posting should be to attract talented people who are qualified to onboard at the low end of the job’s learning curve (p. 75). Think about the energy and enthusiasm, and creativity that would spark. Chances are this would open up internal opportunities. Proven employees who jump at something different, despite the disadvantages, are a hugely overlooked resource (p. 79). Knowing others, and what fundamentally motivates them, is a big deal. Recall how important expectations (of each other) are when composing our PLP. None of us is as comprehensible or knowable as we like to think we are (p. 94). We learned via the Tom Peters Group in our leadership classes that 87 percent of leaders believe they are good communicators but only 17 percent of leader’s subordinates agree. In our Coaching to Develop People workshop, we advise not ignoring top performers (or at mastery level on the S-Curve). Johnson encourages the same: This can come in the form of stretch assignments, since, when challenged, 67 percent of people will demonstrate above-average creativity. Only 33 percent of people show above-average creativity in nonchallenging roles (p. 111). A developmental leader envisions constraints as growth opportunities, or the creation of a motivational environment. Johnson: Your job is to provide the soil, to impose the constraints, that allow your employees to bloom (p. 122). These are perfect tasks to both delegate and develop, keeping steady movement on the S-Curve. Over time, this will create a learning organization. Will individuals make mistakes along the way? Of course. Johnson wisely calls out Harvard Business School’s Amy Edmondson, who has studied failure extensively. Her analysis is that responding wisely to failure is exactly how companies become “learning organizations” and avoid future catastrophes (p. 144). Embracing a developmental philosophy requires courage. Putting employee development first will almost never benefit you in the short term, but over the long term, it will (p. 152). Note: Whitney Johnson generously provided a copy of her book for review. An interesting series of leadership discussions started this month with a dynamic and intellectually curious colleague in Australia. Turns out we connected in May 2017 when I was speaking down under about Strategies for the Agile Leader, basing my talk on General Stanley McChrystal’s book Team of Teams. My colleague has a new role now, Director of Enterprise Agility at a well known global firm that works to help clients become leaders wherever they choose to compete. We connect on the weekend on WhatsApp. In short, we started discussing what it takes to become a 21st century leader, and are considering a series of ChoinqueCast dialogues. Like many, my colleague has been put into a “leadership position” twice in his career. My impression is that he didn’t really buy into the idea of leadership having anything to do with a position. His thoughts turned to Charlie Chaplin in Modern Times, especially the part where Chaplin physically gets stuck in an assembly line machine — highlighting how organizations have treated people mechanically rather than humanely not so long ago. Much of his exposure to leadership so far has focused on processes, not so much people. Maybe times haven’t really changed that much. Like Jim Collins, my colleague is very curious and wants to study business transformation in the United States, observing organizations and how they work. He wants this course of study to form his Ph.D. thesis. Following and possible contributing to this journey may be the basis for our dialogues. We shared a couple significant topics such as vulnerability, the hazards of a scarcity rather than abundance mindset, and use of a Personal Leadership Philosophy. Great 21st century leader traits. Curiosity is both the hallmark of a coach, as well as a leader. Stay tuned for a series of dialogues on the ChoinqueCast. Leaders Connect Worldwide. During a recent in-house Academy Leadership Excellence course, the topic of feedback came up. One of the attendees mentioned Kim Scott’s recent book Radical Candor. More specifically, the client wanted to bring up the behavior Ruinous Empathy. Several in the course mentioned that not enough helpful feedback occurred within their organization, in particular coaching. One specific attendee, during a self-evaluation exercise, described an otherwise positive and knowledgeable boss, who in six years, had never actually provided any performance coaching. So, what is Ruinous Empathy? Let’s start with Radical Candor. Radical Candor occurs when we care personally and challenge directly. When we care personally but don’t challenge directly according to Scott our lack of feedback constitutes ruinous empathy. Here’s Scott’s two other terms: When we challenge directly and don’t care personally we’re offering Obnoxious Aggression and when we neither care personally nor challenge directly our lack of feedback is Manipulative Insincerity. We can think of ruinous empathy as the combined outcome of conflict avoidance and the knowing-doing gap. We care deeply, know we should say something, yet avoid doing it. We do this at work and we do this at home. What feedback have you been conflicted about sharing? Are you helping or ruining people you care personally about? Leaders Give Candid Feedback. This review introduces Israel’s Leadership Philosophy regarding water, highlights several key leadership analogies, and examines the results of truly embracing and living this way for decades. This is perhaps the most significant analog, as Israel is essentially an arid, desert country. Who had an abundance mindset? Simcha Blass, who was the central character in leading the thinking and planning about Israel’s water, and later in transforming agriculture around the world (p. 23). The predominant, or scarcity mindset, was held by the British. They (p. 33) gave testimony to the United Nations (UN) delegates and reiterated their belief that the territory could not provide for the many homeless, stateless Holocaust survivors then in refugee camps in Europe, two years after the war had come to an end. • There were large amounts of water below the surface of the Negev desert that could be found by deep drilling. • Proposed pumping water out of the Yarkon River, north and east of Tel Aviv, and transporting it to the Negev, primarily for agricultural use. • At some undetermined time in the future, water would be brought from north to south via mostly underground infrastructure that would bisect the nation. Notice that the first phase, if successful, could quickly dispel a paucity mindset. This vision set up Israel for a decades-long march toward their national objective. The second and third phases implicitly suggest a national strategy, in contrast with many countries. Siegel notes that many Western countries have sleepwalked into counterproductive legal and regulatory structures, while their citizens, agricultural sectors, and industries have carelessly adopted wasteful – even destructive – consumption patterns (p. 220). Israel’s story serves a perfect example of Jim Collins’ 20 Mile March from Great by Choice. Siegel calls out The National Water Carrier. It was a feat of imagination and daring, requiring engineering innovation and a variety of financing vehicles, including one that led to riots and deep divisions that took years to heal (p. 20). However, the best leaders communicate a clear vision, align teams, and execute. Siegel observes: Large infrastructure projects that are completed on time and on budget give the larger public a feeling of civic pride and enhance national identity (p. 38). A couple guideposts along this marathon: No other country makes the reuse of its sewage a national priority as does Israel. Over 85 percent of the nation’s sewage is reused (p. 78). Also, Israel learned along the way that reclaimed sewage is more reliable because it isn’t dependent on the vagaries of climate and rainfall, and even with all of the infrastructure required to develop it, reclaimed sewage is ultimately cheaper (p. 86). Collaboration was also necessary by the government. Siegel recognizes The Chief Scientist program represents the best of government engagement in industrial policy (p. 167). This allowed incubator program acceleration of numerous water developments. trade, buy, or sell water in its many forms” (p. 190). Many differing people can work together when one grand idea links politics, economic development, water usage, and the environment (p. 194). Pfeffer and Sutton’s The Knowing-Doing Gap informs us that when knowledge is treated as a process, rather than a static item to be stored, breakthrough performance results. Israel embodied this concept starting with Blass using the diversion of the Colorado River as a model (p. 26). A perhaps counterintuitive example of knowledge sharing was Israel’s real pricing, or elimination of distorting subsidies. With no rationing or limit on supply, real pricing induced customers to cut their use of household water by sixteen percent (p. 47). As vital new knowledge grew, leaders such as Nathan Berkman decided in the late 1960s and early 1970s to have his government division go into business and to start selling the group’s desalination know-how – such as it was – to others (p. 114). Think of the challenging Israel | Jordan | Palestine relationship today. As a result of Israel’s water leadership, dialogue over water can be a vehicle for confidence-building measures that can led to progress in some of the other areas of dispute (p. 173). Knowledge sharing now has international reach. MASHAV (a Hebrew acronym loosely translated as Center for International Cooperation) embodies this spirit (p. 209): “We were there to help by teaching and training, but not by providing financial assistance” to African states, Asia, and South America. • 1955 | prohibited any drilling for water without first obtaining a license. • 1955 | prohibited any distribution of water, unless that supply was done through a meter. • 1957 | placed river water, streams and rainwater under government control. By living within this philosophy, The Water Authority wanted to change [prevailing] culture and to use Israel’s cities as laboratories for new ideas in water (p. 48). Fast forward several decades: Israel is now a leader in plant research (p. 68), as a result of numerous water-efficiency initiatives. Perhaps the greatest innovation to date: Due to the use of the RO (reverse osmosis) membrane, the water wasn’t just the highest quality water to be found in Israel in terms of cleanliness, low salinity, and high clarity; it also turned out to be about fifty percent cheaper than any of the cost estimates the Cabinet had received when deciding to pursue desalinated water (p. 121). Ilan Cohen: Today we are in a period like the dawn of agriculture (p. 127). covered by desert today than fifty years ago (p. 98). Note: Seth Siegel generously provided a copy of his book for review. During a recent executive coaching session, our primary focus was reviewing organizational changes made over the past 90 days. You see, the client is restructuring several groups, with the specific objective to improve operational results, eliminate redundant work, and vastly increase team accountability. The beginning of the presentation would please any executive interested in measuring operational results. One slide contained a line graph illustrating a dramatic decrease in team support response time. As substantial as that result was, it wasn’t the one that really drew attention. From our coaching sessions, it was evident one of the more important decisions was a hiring selection, bringing on board a program manager who could become effective as soon as possible. One of the charts showcased the new hire, and more importantly, all the work delegated and accomplished in a very short period of time. Looks like a very solid decision-making process was behind the hire. The episode made me think of a story our Board Chairman shared years ago when in my start up CEO role. Durrell’s story was about an important engineering job he was responsible for when working at Motorola. The job was to design the first integrated circuits for Motorola’s first four-function calculator. Yeah, that was a while ago. Durrell could have done the work himself, or he could have delegated the work to highly experienced design engineers. Guess what Durrell Hillis did? He assigned the job to a couple “fresh-outs,” or recent college graduates. Durrell cared as much about the development of the new engineers as he did about getting the job done. That what an engineering leader does. It’s also what my client is doing while restructuring her organization. For her, it’s not just about improved processes. It’s about changing the way work gets done by making good hiring decisions and letting people know they are accountable for results. As I listened during the coaching session, communicating this hiring and delegation story to the executive team at the 90 day checkpoint was the most important item. Especially giving credit to the new program manager. How do you facilitate organizational change? How much does development fit into your hiring decisions? Leaders delegate and instill accountability. In a recent coaching session, the client shared a revelation which occurred after attending an Academy Leadership Excellence course. She realized her everyday work rhythm was an exhausting attempt to get as much done as possible, often performing multiple tasks at the same time. That’s right - multi-tasking. We all do it. And it’s a really bad habit we should avoid as leaders. A quick exercise will prove why. Try this, either now, or sometime in the future. You’ll need something to record time, like a stopwatch timer on your smartphone. Start with two blank pieces of paper. On each page draw two vertical lines creating three empty columns. Here’s what to do. In the first column, you’ll list the letters a-j, the first ten letters of the alphabet. In the second column, you’ll list the numbers 1-10. In the the third column, you’ll list roman numerals i-x, the first ten roman numerals. Here’s the catch: The first time you perform this timed exercise, you’ll fill the page moving across the page, starting with a, then 1, then i, switching columns each time. Go ahead and do that and have your timer record how many seconds it takes. You’ll notice a lot of starting and stopping. The second time fill out an entire column one at a time, starting with a-j, then 1-10, and lastly i-x. A lot less switching. Notice the difference in your times. Chances are it took you 40-50% longer the first time. Context switching is why. When we switch between tasks, we’re spending time, and precious energy, simply moving between the different activities. And with each additional task added, the working time available for each task decreases. Typically the context switching loss between three exercises, as in the exercise we just tried, is about 40%. It gets worse. By the time we are performing five simultaneous tasks, context switching loss is nearly 80%. Might as well not even work anymore at that point. It pays to identify your genuine High Payoff Activities, and then work on them one at a time. What are your High Payoff Activities? Do you prioritize them and focus on them every day? How do you avoid distractions? Leaders Avoid Multitasking. S. Chris Edmonds shares a methodical, step-by-step how-to manual for developing and implementing an organizational constitution. Subtitled A Framework for Driving Results, Inspiring Your Employees, And Transforming Your Workplace, we may consider this guidebook a highly recommended supplement for Academy Leadership Advanced Leadership Course graduates. This unique road map encompasses both use of a Personal Leadership Philosophy (My Leader’s Compass workshop), normative behavioral statements (Core Values Alignment workshop), and additionally includes Cultural Effectiveness Assessments (five questions each) which may be used for tailored Survey Monkey analysis. Just as Jim Collins stresses values alignment, Edmonds learned that aligned behaviors are the pathway to workplace inspiration – and that misaligned behaviors lead to workplace frustration (p. xviii). This review links each of the book’s three parts: Defining, crafting, and managing to an organizational constitution, respectively, to key leadership concepts and relevant Academy Leadership workshops. I | Definition | Why Do This? • Genuinely Connecting with Team Members. • Sharing Your Assumptions and Your Learning. A commitment to continuous and open feedback is required to do this, which likely will require increasing relational capacity with your team. Recall commitment to feedback is one (of eight) of the key parts of a Personal Leadership Philosophy. The validation level is the highest degree of workplace inspiration, with indicators reflecting leader to coach transformation. Not only is credit given for efforts and accomplishment, responsibility and authority is given to engaged, talented team members (p. 10). Consider how most organizations treat culture administratively, merely displaying posters and/or web pages proclaiming myriad noble traits. We need to actually do much more. The challenge with this model is how to measure the values match (p. 21). How do we do this? Edmonds contends the only way to shift values from lofty, vague references is to define values in observable, tangible, measurable behaviors (p. 22). This sentiment, or call to defined actions, is the central message of the book. Most of us have probably tolerated poor values performance as an occasionally necessary trade-off with superstars. But, the upper-left quadrant is where the most damaging players reside (p. 23). In The Integrity Dividend, Dr. Tony Simons defines behavioral integrity as managers demonstrating their organization’s values and doing what they say they will do (p. 31). Or, more simply put, walking the walk. You create your legacy with every plan, decision, and action. Everything you do tells your boss, peers, team members, and customers what you stand for (p. 34). Consider how different this environment may be from your current one. First, culture must become a high-payoff activity (HPA - from Setting Leadership Priorities workshop). Edmonds: “You’ll need to redirect time and energy to culture-champion activities from less important actions (p. 39).” This may seem alien. Recognize most team leaders and team members have never lived in an intentional, high-performance, values-aligned work environment (p. 40). Comparable to day three of an Advanced Leadership Course (Personal Development Plan), Edmonds requests that we clarify [our] personal purpose (p. 43), and further add observable, tangible, measurable behaviors to each value (p. 51). This process is nearly identical to the Core Values Alignment workshop. On pages 56-63, Edmonds outlines a robust process for creating a Personal Leadership Philosophy. In the absence of clarity, with no formal declaration of purpose or mission, the practical reality of day-to-day activity becomes the accepted focus, the norm (p. 72). An effective purpose statement should be clear about what the company does. 2008 Research (Institute for Corporate Productivity) found that while 84 percent of organizations studied have published a mission statement, 62 percent of those companies said that just half of their employees could repeat it (p. 78). In Delivering Happiness, Tony Hsieh’s story of Zappos, the company’s values have been jointly developed, communicated and demonstrated throughout the company. Edmonds calls these behavioral terms. Values and valued behaviors are the evidence of your constitution that is noticed by people – customers, potential employees, everyone who comes into contact with your team members (p. 89). In our Accountability: Building a Culture of Responsibility workshop, we learn that responsibility is an internal force and accountability is an external force. We may apply this to strategies & goals. Edmonds describes strategy as where the company’s vision of the future intersects with the realities of the now, where traction is gained one product test and one happy customer at a time (p. 113), but likewise mentions that we often don’t publish or share them. • What opportunities or imperatives shall we consider? • Decide (prioritize) how to leverage company’s combination of skills, vision, and ingenuity. • Assess progress on and effectiveness of strategies and goals. • Employee satisfaction or engagement. Edmonds tells the inspirational story of Garry Ridge (WD-40) who began studying tribes, including Aboriginal tribe behaviors. Their first tribal attribute is identity and belonging; their second attribute is learning and teaching (p. 156). That’s getting to the heart of engagement. This leads to transformational leadership. While team members apply their time, energy, and skills toward meeting (or exceeding) formalized goals, the leader takes on the role of performance observer and coach (p. 163). This is what Stanley McChrystal learned and shared in Team of Teams. Many of our written Leadership Philosophies state Leading by Example. Why is this so important? Before any team members can be asked to embrace the new values and behaviors, leaders – those with formal supervisory responsibility – must put themselves on the line by living the values and behaviors and inviting feedback through the values survey (p. 182). • Don’t take the resistance personally. • Present what you’ve heard and observed in a calm, nonblaming, nonjudgmental manner. • Understand the resister’s perspective. • Every leader must be fully on board. • Give the resistant leaders a chance to align to your organizational constitution. Do you hire primarily for values alignment? If your team or company is like most others across the globe today, the primary lens you use when hiring new players is that of skills and past accomplishments (p. 205). This is what the Riggs’ concluded in Counter Mentor Leadership. Note: Chris Edmonds generously provided a copy of his book for review. Dan Pontefract, author of the fantastic book open to think, offers Open Thinking, as an antidote. Dan describes how today’s habits inhibit both the clarity and quality of their thinking, and the major block to open thinking is influenced by reflection and action. Imagine action on the x-axis of a graph, and reflection on the y-axis of the graph. If we reflect, but do not take action, we’re indecisive. If we take action without reflection, we’re inflexible, and if we are not reflective and do not take action, we’re indifferent. Open thinking occurs when we are both reflective and take action. I’m going to recommend open to think to my client, because our coaching sessions suggest what she really wants is more open thinking. Her action plan and our first coaching session described it, and open thinking captures what she want to do more of. How often do you reflect, or write in your journal about your growth as a leader? Do you take action without reflection? Leaders are open thinkers. This choinquecast was scripted while on a morning flight from Denver to Tampa, after we finished a three-day Academy Leadership Excellence Course in Colorado Springs. A common theme during our several days together was the desire to occupy a leadership role, but the tendency to stay in a management, or task-oriented mode most of the time. One of the more courageous in the group admitted exasperation at being in “crisis mode” every day, and how exhausting it had become over the past couple years. Most of the attendees were program or project managers, who in their hearts, really want to operate more from a leadership mindset. This brought to mind Alan Berson and Richard Stieglitz’s terrific Leadership Conversations, which challenges readers in Chapter 1 with the question “Do I want to be a Leader” and systematically outlines comparative management and leadership styles within four conversation types. Their book seems perfectly suited for Project Management Professionals (PMPs), those thrust into relatively new leadership positions, and those ready to advance their leadership level. The last workshop was more advanced, a set of case studies which introduced effective decision-making, including a comparison of time and development-based decision making styles. Working as teams, everyone really poured their hearts into the workshop, and learned that leaders can make decisions based on developing others, not just based on cost and schedule. It was illuminating listening to the revelations from everyone in the symposium. What conversations do you have as a leader? Does your decision-making process focus on development of others? Great leaders focus conversations and decisions in order to develop others. Kimberly Davis shares her Brave Leadership Manifesto on page 267. Read that first, then again after finishing this bold and refreshing work. Davis weaves her personal transition from actor to leader with many revelations we likely have encountered (or will). After defining Brave Leadership, Davis details numerous barriers, usually self-imposed, that prevent our path to courageous leadership, and how to overcome them (pushing through). Answering “What happens to our creativity?” is essentially the driving force in Davis’ reflections. This review highlights our outdated, limited and ineffective model of connecting with others, how we tend to hold ourselves back, and suggests integrating Davis’ findings into leadership lessons we have learned, especially use of our Personal Leadership Philosophy. In our Coaching to Develop Leaders workshop, we viewed The Teddy Stallard Story, which poignantly reminds us we never know when something we say or do (or do not) may affect someone’s life forever. Davis concludes the same: Like it or not, your behavior and actions (whether conscious or unconscious) have an effect on the people around you (p. 9). Or put another way, think of Brave as an active path (p. 13). Leadership, likewise, is best thought of as a verb, also as a description of activities; rather than a position, noun, or description of a group or class of people. What is means to be brave at work today requires more of us than ever before, which can feel incredibly scary and uncomfortable (p. 17). Reminiscent of Frederick Winslow Taylor, Davis recalls the classical manager’s job was to make sure that people did what they were told to do by the time they were told to get it done (p. 17). Like many of us, she has found people are tired of playing [that] game. All the posturing – what vulnerability and shame expert Brené Brown calls jockeying for attention – false pleasantries, snarky comments, and decisions made by spreadsheets that don’t consider the human toll, have left people leery (p. 24). This nicely sums up our current state of affairs. Let’s think about motivation. Davis stresses that to want is powerful (p. 28). Back in the paycheck-exchange era, it was a lot easier to motivate someone with a carrot or a stick because whether or not they wanted to give you their best didn’t matter quite as much (p. 28). Davis views our contemporary motivation model with want at the center of commitment, loyalty, engagement, satisfaction, creativity, passion and joy. Want transforms deadlines into achievement, obstacles into adventures, and colleagues into collaborators (p. 34). Dr. Carol Dweck’s book, Mindset: The New Psychology of Success compares a growth mindset with a fixed mindset (p. 47), as Davis concurs this is a major internal obstacle for many of us. Rather than seeing that talent, looks, and achievements can be cultivated – that a single incident doesn’t define you – people with a fixed mindset decide about themselves and others, limiting what is possible (p. 48). Once you think about this, you’ll probably catch yourself slipping into a fixed mindset from time to time. It’s sneaky. Davis revisits Maslow’s hierarchy, describing our core needs as human beings. Think of our Energize2Lead colors, particularly dominant (social) yellow colors. The colors mean more than a social temperament. Belonging feels good. Not belonging, not so much (p. 67). It seems many of us have been trained not to connect, when in fact, that is what is needed most. However, we are psychologically designed to avoid vulnerability at all costs (p. 71). It’s more than just conflict avoidance, it’s actually much deeper. Davis calls us out: Vulnerability is our biggest barrier to brave and the gateway to our most powerful self (p. 76). This section is the heart of the book. Theater practitioner Konstantin Stanislavski discovered that the most powerful performances – the ones that drew the biggest crowds, the loudest applause, that kept the audience at the edge of their seats with baited breath – were by actors who did something different than all the others (p. 88). Self-evaluation, such as answering What Will I Do Differently? (WWIDD), at the end of our leadership workshops, is the key to unlocking our own differentiation. Another way we trip ourselves up: When we’re focused on proving ourselves, our actions can be destructive (p. 107). If you are the type who struggles to delegate – because “It’s just easier to do it myself,” there’s a good chance you are limiting self-growth. Davis learned over time a great performance is one in which the actor can move beyond their concerns about what others think and have the courage to focus on powerfully igniting a moment in time and truly connecting with their fellow actors on the stage (pp. 108-109). Replace actor with leader and team members, respectively in the passage. It’s all about connection. Davis challenges statements that merely list core values, guiding principles and beliefs. This is why a leadership philosophy should include eight elements, which together form a call to action. Recall a value in action is a virtue. Davis calls for a Super Objective, likewise with implicit, active leadership. She includes an Uncover Your Super Objective exercise on pages 126-130, similar to composing a personal leadership philosophy. The goal is a deep connection, since research shows that the ability to empathize has a direct correlation to higher job performance and increased customer satisfaction in the business world, and faster recovery for patients in healthcare (p. 147). Note: Kimberly Davis generously provided a copy of her book for review. Executive presence. What it that? This has come up several times during coaching sessions recently, including a one-on-one with the advocate for a director who will soon move to the C-Suite. In both sessions, the discussions included meetings, and how performance could be improved during them, along with increased executive presence. Here’s a couple ideas to consider. Try the 2 + 2 Rule, mentioned by Dr. Mindy Hall in Leading with Intention. Dr. Hall learned of the 2 + 2 rule from a trusted senior executive. Here’s how it works. First, before any meeting, think of two questions to bring up during the meeting. Maybe on the walk to the meeting. At a minimum, it will demonstrate curiosity, willingness to learn, engagement, and that you are actually listening. Second, think of two things to contribute during the meeting. Perhaps an observation, something you picked up reading a book, or an interesting article about your industry. Maybe it’s a valuable insight you are able to share with a colleague or recognition of something special someone in the organization did. It takes very little time, but forces you to reorient the way you approach the meeting, and your attitude, which will be readily visible to others. Do you have weekly team meetings? What is the format of these meetings and who chairs them? In my last “corporate” executive role, we called our team the six-pack, which also corresponded to the maximum number of direct reports I was effective at actually coaching. After an off-site meeting, we set up several ground rules for weekly meetings. The first rule was that we would rotate who actually chaired, or facilitated the meeting each week. This included our entire team, including our administrator, and directors in Florida, Indiana, Arizona, and Kanata, Ontario. Everyone had a different style, highlighted different people and activities, and we quickly learned a lot more about each other. The next ground rule was that the first meeting item was recognition of something a team member did in the last week that was admirable, or just really cool and likely unknown to the rest of the group. After a couple weeks, it was amazing to find out all of the things going on in our group, and humbling to anyone who really thought they knew “what was going on” all the time. Oh, and a wonderful side benefit - our average meeting time dropped from just under 30 minutes to not more than 15 - since we were better connected throughout the week. The last rule, a hard commitment - one 30 minute session, one-one-one between me and each direct report. Since we were geographically diverse, this was usually a phone call. Needless to say, this was a very high performing team. What does executive presence mean to you? How do you demonstrate it daily, weekly, and over time? Great leaders lead meetings.